Thinking about a biking holiday? There’s nothing like a little time out on the road on your bicycle. You can see and feel your surroundings in a very intimate way – something you can never get on a motorcycle or in a car. The feeling of arriving at some inspiring new vista under your own power, freed from the roar and exhaust of the internal-combustion engine, can be exhilarating and memorable. But if you really want to get out to explore some new, wild spaces, you’ll likely have to load the bikes onto your car or truck to make it possible. It’s a necessary evil. Click Here to See Our List of the Best Roof Mount Bike Racks. To carry the bikes you’ll need some type of vehicle-bicycle carrier. There are a dizzying variety of these available, but they come in three basic types: the hitch-mounted (a rack mounted to a receiver hitch fixed to the rear of your vehicle); the trunk-mounted (a rack mounted to the trunk of your vehicle); and finally, the roof-mounted, which attach to crossbars on the roof of your vehicle. These different types of bikes carriers have their advantages and disadvantages. The rack you choose will be based on what you need, where you are going, how many and what types of bikes you have, and a host of other factors. But here, we are concerned with the roof-mounted rack. Why Should You Choose a Roof-Mounted Rack? 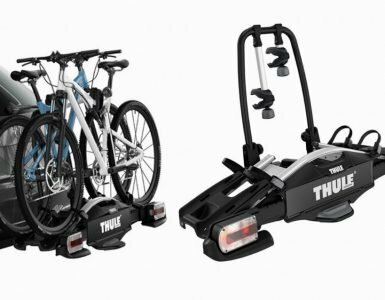 The roof-mounted bicycle rack offers some great advantages for those who own certain types of vehicles, with certain types of accessories. These types of carriers are designed to be attached to crossbars installed on the roof of your vehicle. 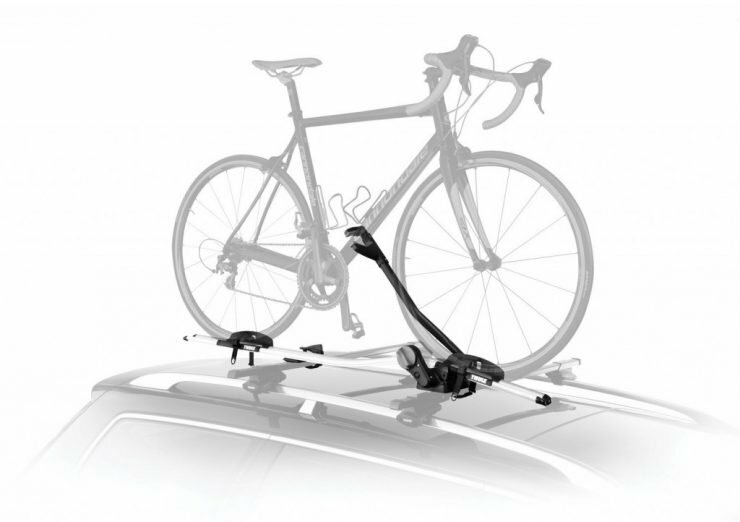 If you already have a crossbar system, a roof rack may be right for you. And a roof storage solution based on crossbars tends to be quite versatile. They can carry more than just bikes. You can load on surfboards, skis, kayaks, and several other kinds of carriers. Also, these racks tend to be best suited to vehicles that have lower roof heights. Not only do you have to be up and over your vehicle to install the rack, but you will have to lift your bike up and over to attach it to the crossbars. Can be tricky. It is definitely easier if you are tall and comfortable with lifting a heavy, awkward bicycle up to the height of the roof. 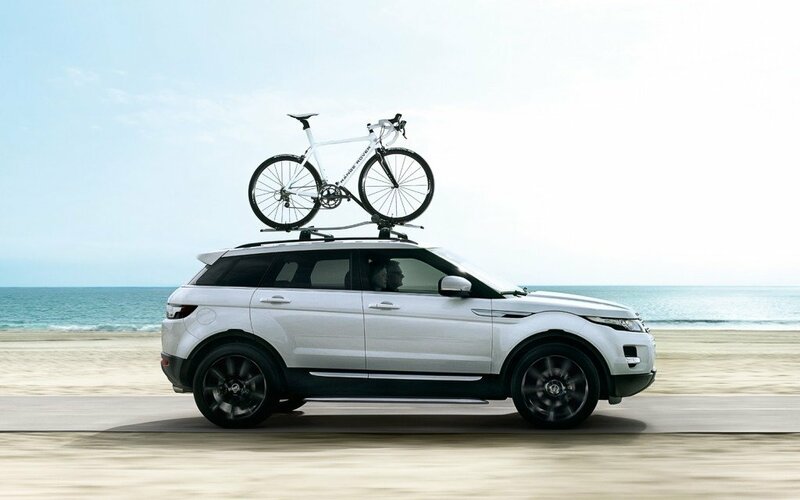 So, the roof rack might be your best choice if you want to carry bikes on a car – rather than an SUV with a high profile. The Thule 598 Criterium has been around for a while. This carrier, which is designed to carry one bike in a standing position,is a cyclist favorite because of its simple design, dependability, and stability on the road. It’s also a sleek, stylish looking piece of gear. And you don’t have to remove your front wheel to use it. The carrier grips your bike with a combination of an aluminum wheel tray, adjustable wheel straps, and a pair of padded jaws(some refer to it as a C-clamp) at the end of its sturdy center support. Thosejawsgrasp the down tube of your bike and can be gently tightened with a large dial near the base of the support. Worried about your brake cables? There is a channel in the padding to make room for them. Ready to load your bike? Just lift it up and set the tires on the wheel tray. You hold on to your bike with one hand, and with the other hand fit the jaws around the down tube and adjust the tension of the jaws. Then, loop the wheel straps onto the tires and tighten. When it’s time for the bike to come down, you release the jaws by pulling a small trigger. The padding provides some protection for both the bike’s frame and cables. Because of the limited size of the jaws and the wheel straps, it is important to keep in mind that this carrier fits bike frames up to 3-3/8 in. in diameter and will accommodate tires up to 2.6 in. wide. The rack clamps easily to your crossbars. 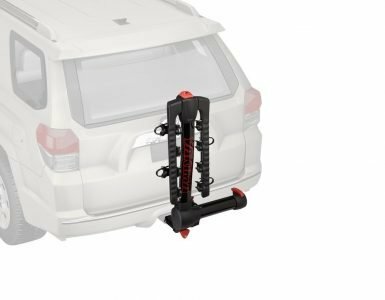 The manufacturer says this rack will fit Thule square bars and round bars and can be used with Aeroblade/Aeroblade Edge with an adapter – the Xadapt8 — which is sold separately. The rack is lightweight (only 10.58 lbs.) and is easy to handle when installing. And when you’re not using it, the Criterium folds down very neatly and compactly. We expected to hear some complaints about damage to the paint on the down tube caused by the jaws. But we haven’t experienced this or heard much about it. Some say not to use this rack with a carbon frame. But, again, we haven’t heard any disaster stories. It is necessary to take your time when loading your bike, however. Don’t rush it. Be sure the wheel straps are solidly fastened. Test it. Try to move the bike. It should feel like it’s a part of your car. For us, though, the only real issue is the height the bike when it’s on the carrier. But that’s the way it is with roof-mounted racks. If you can deal with the lifting, and don’t forget you have bike standing tall on the roof while driving, you’ll be in great shape. Careful going through the drive-thru. Ultimately, though, users report that this rack provides solid support for your bike out on the road. That central supporting arm and the big padded jaws do what they are supposed to do: hold your bike tight. And this is what you want when you buy a rack.